The summer of 2015 has been filled with celebrity breakups and the deconstructed portmanteaus that follow. In the past 24 hours alone, we’ve seen the end of Gwavin, Rebarvel, and Zerrie. 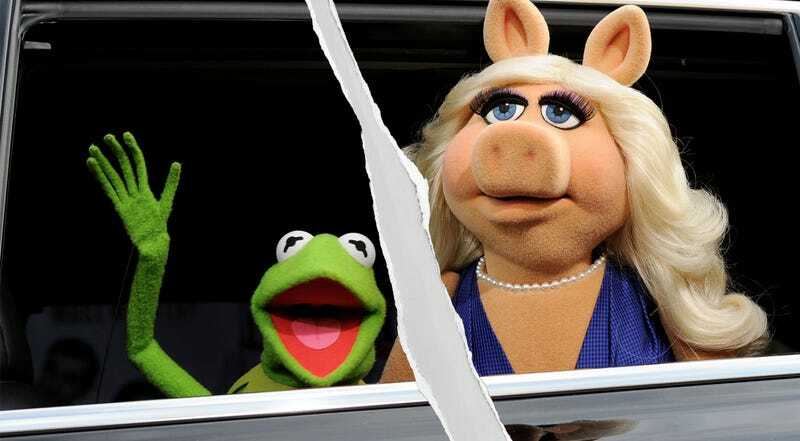 And now, as though the dead horse of love hasn’t been beaten enough this season, ageless felt icons Miss Piggy and Kermit the Frog have announced their breakup. After careful thought, thoughtful consideration and considerable squabbling, Miss Piggy made the difficult decision to terminate our romantic relationship. We will continue to work together on television (“The Muppets”/Tuesdays 8pm this fall on ABC) and in all media now known or hereafter devised, in perpetuity, throughout the universe. However, our personal lives are now distinct and separate, and we will be seeing other people, pigs, frogs, et al. This is our only comment on this private matter. Thank you for your understanding. Their love had always seemed like a vision, but now we know it was only an illusion.